Residential & Industrial Window Cleaners Greater London SE | Quality Property Care Ltd.
Don't miss the possibility to finally get rid of the long-lasting and dangerous domestic and residential specialist cleaning chore. Count on our professional window cleaning company! We would be glad to support you. Contact our kind and helpful customer support associates via this phone number 020 3746 4287 and get all the info you need today! To achieve our famous results we apply a simple water-purification method which strips away normal tap water from its minerals. This leaves it a bare H2O molecule which is a lot lighter and sticks a lot more to dirt, grime and mud. The technique is a very efficient way of cleaning away even the dirtiest of window surfaces and can reach up to 4 stories in height. Applying a telescopic water-fed pole we clean the window sills and windows from the bottom to top using only water, no detergents as detergent get even more dirt if not rinsed with water. Additionally detergents may have corrosive properties on PVC surface types and cause the seals and gasket of the windows to decay and rot faster. The size of the water fed pole lets us to clean business buildings without having to use a ladder or ropes. Rope systems are accessible for commercial clients, call us at 020 3746 4287 for more info. This service is not hourly based, meaning that you book us per window, we go away once you are happy. Routine maintenance on all of the windows to be cleaned should be completed in order for us to properly clean the seals, glass and frames. A minimum callout price of 35GBP does apply, however, if you book us in advance you will get a lower price. You can contact us for a same-day cleaning, during bank holidays and weekends at no additional fee. For us to be capable to clean effectively there must be a crystal clear access to the windows and a parking place within 30 meters on the same side of the home as the glass windows. We are not capable to clean wooden window frames and sills with our water-fed system, or we might damage the glass and paint. We work for shops, offices, residential homes, restaurants, tenants, landlords, property managers, libraries, public buildings and a range of other customers. We are also offering you an internal window cleaning job which can be combine arranged with the outdoor window cleaning service. At a lower rate you can book both and get your office or home windows cleaned along with your gutters and conservatory roof and windows. To properly clean inside we use a skilled grade squeegee, a ladder, a bucket, protective gloves and a specific detergent mixture. The detergent is applied then left to react with any dusty or greasy stains on the inside of the window. After that it is scraped away with the squeegee leaving your windows spotless. The business Quality Property Care Ltd. can provide you with you higher floor window cleaning through the specialised rope access windows cleaning groups. They will clean all windows over the 4th floor.Additionally, the provider offers indoor window washing as a separate service, or as part of regular or one off residential and commercial cleaning.The cleaners will clean the windows in all kind of professional properties and all kind of home properties with the help of microfiber cloths, squeegees, professional and safe glass cleaning solution, and with the help of ladders whenever necessary. You can combine the outdoor and indoor window cleaning with the expert curtain cleaning provided by the organization as well, for an even more amazing effect. 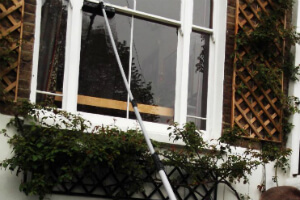 There is no better approach to clean up windows in London than to contact Quality Property Care Ltd. in Greater London SE, we come fully ready, able of reaching up to 4 stories in height. There are some service specifications that need to be fulfilled in order for us to effectively clean. The window must be in a good condition, maintenance must have been passed before we can clean. A parking spot near the area of the cleaning, no further than 30 yards preferably and a clean reach of the window without any obstructions, like branches or walls. Don`t waste time, but give us a call on 020 3746 4287! Get a 100% free quotation right now! See our budget-friendly rate list and get a reservation for risk-free and helpful window cleaning in Greater London SE right now!